Well! 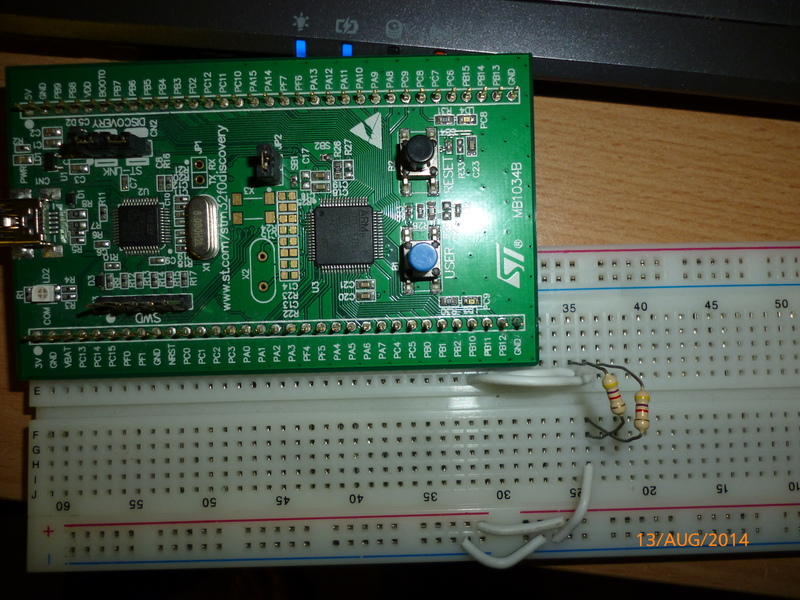 I’ve had a fair few requests in the past few weeks about how I got the HMC5883L digital compass IC working with my STM32F0 discovery board (as shown in a previous post: https://hsel.co.uk/2014/05/29/hmc5883l-magnetometer/). I’m really not a fan of the I2C implementation on the STM32F0 discovery board as many things don’t seem particularly apparent at first, not forgetting that you have to configure the clock speed using an external calculator – Yuk! For future reference, the STM32F0 I2C speed calculator can be found under the name: STSW-STM32126. Such an easy to remember and descriptive name, I know! A link to the calculator (which may expire): http://goo.gl/Zeep7h. Remember however, the above value is not inclusive of any overhead such as returning the internal register pointer back to the first register, the X value. Since we’re running at such a slow rate – 100kHz in my case, I’ve used 4.7k resistors for my pull ups. This was mainly because I had them to hand and they strike a good middle ground between power consumption and rise time, along with being a relatively low impedance. At 3.3v, with both SCL and SDA lines low, the maximum current consumption will be roughly 1.4mA (3.3v*2/4700) The STM32F0 is also utilizing the internal analog filter on the I2C lines to help filter any potential noise too in my implementation. The data sheet (http://goo.gl/XMYQ31) is really good and gives a good description of what each value should do. The HMC5883L contains three main registers for setting the parameters within the chip, namely: Config register 1, config register 2 and mode register. Config register 1 contains the settings for the sample averaging, the output rate and measurement configuration (if you require sensor bias). Config register 2 contains the settings for the gain of the sensor. The Mode register contains the settings for high speed I2C mode and the sensor mode. Now! Lets get on with some coding. As per usual, we want to declare out top of file parts, the HMC5883 defines, included files and structs. //as it doesn't work without it! As you can see, I’ve shifted the address up by 1. My only explanation for this is that the STM32F0 I2C peripheral automatically sets the read or write bit (LSB of the I2C transfer) depending on the value you send to the “TransferHandling” function. Either way, shifting up by 1 sorts the problem! If you hadn’t got this vibe yet, I’m really not a fan of the STM32F0 I2C implementation as its nowhere near as simple as the arduino “Wire” library (yes, I wouldn’t expect it to be as this is bare m3t4l but they sure don’t make it as easy as the SPI or USART peripheral!). So prepare yourself for the next two I2C functions. 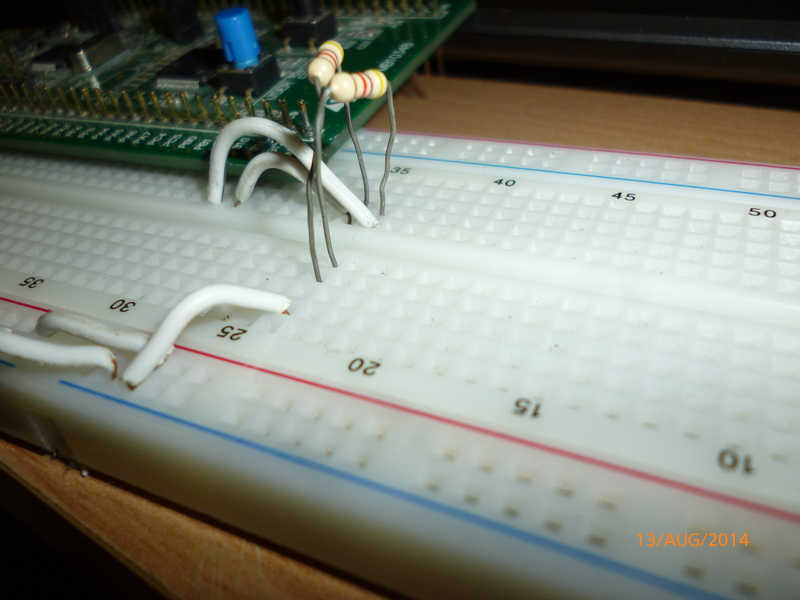 I have used an I2C function to write to registers and read from registers. //voila! We have the compass values! 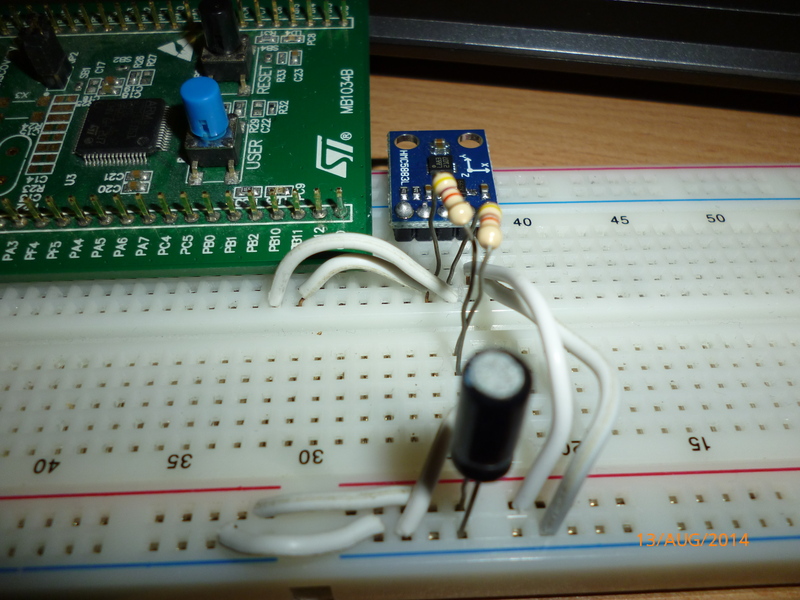 //As per, ensure the I2C peripheral isn't busy! //Again, start another tranfer using the "transfer handling"
//be writing data to the HMC device. //Wait until transfer is complete! //indicate that we want to read. //Wait until the RX register is full of luscious data! //less than 1, otherwise 0 will be returned. I hope the code is pretty self explanatory in the commenting so I shall continue on. If you have any questions, just ask! For time keeping, two pretty standard functions are used – the SysTick interrupt handler function which increments a millisecond variable and a delay function that operates the NOP instruction until x milliseconds have passed. //until "Time" amount of milliseconds has passed. As with standard code structure, next comes main! The main initializes all the hardware components include the GPIO and I2C interfaces. It also sets up the SysTick interrupt handler at 1ms. Constant variables are used to store the register configurations and hopefully the names are pretty self explanatory! The registers are written to, then a small delay is present before the reading on the device occurs. The HMC5883L is polled through I2C for the data to be ready. 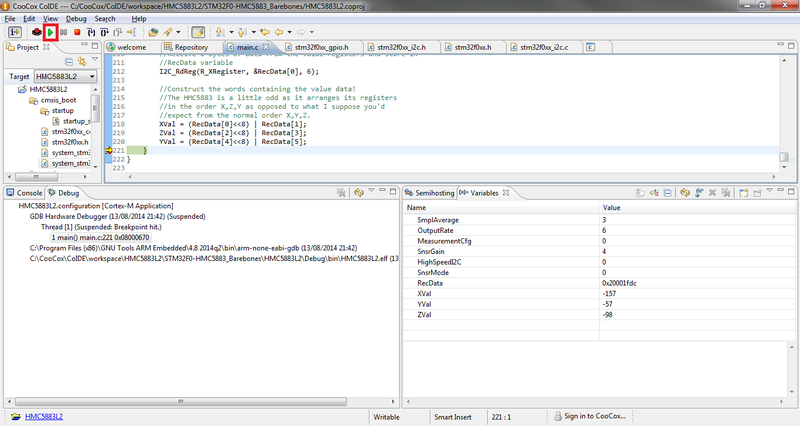 Once this data is ready, 6 bytes are read and stored in their corresponding variables, namely XVal, YVal and ZVal. //Write the configuration registers for the HMC5883L compass. const uint8_t SnsrGain = 0b100; //A gain of 440LSb/Gauss, standard. const uint8_t HighSpeedI2C = 0; //We want standard speed I2C. //Give the sensor a breather before reading data! //Construct the words containing the value data! //expect from the normal order X,Y,Z. Once again, sorry for the horrible code formatting! To test whether the sensor was actually working, I used the standard debug mode within Coocox. this mode can be easily activated using the debug icon . Using the debug mode, I can read the values stored in XVal, YVal and ZVal. By rotating my breadboard with the sensor on, I can view the change in these values and determine the position of local magnetic fields! 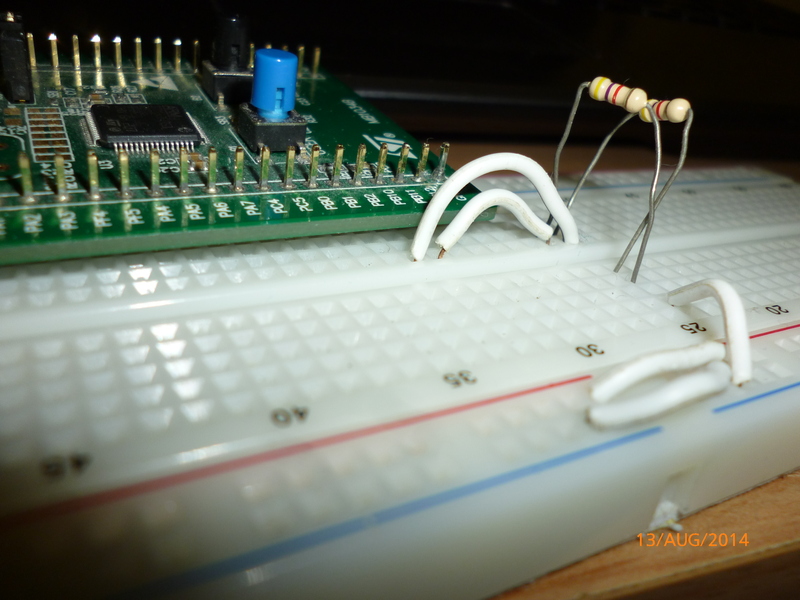 Talking of breadboards, the construction sis really simple requiring few wires, two resistors and I’ve included a 4.7uF capacitor for safe keeping! The initial configuration using the two 4.7k resistors connected to the 3v positive rail. Next, I added the power wires for the HMC5883L sensor. not the best view but its the standard stuff – 3v to 3v, 0v to 0v. And finally, slot the chip in! You can see the 4.7uF power supply smoothing cap too. Step 1: Press the debug button and you shall be transported to the magical realm of debugging. The initial debugging screen once the debug icon has been pressed. Once the debug initialization is complete, you will be met with this screen, now to step 2! Step 2: Set a breakpoint on the bracket after YVal = (RecData<<8) | RecData;. This will ensure that all three values are read before the program pauses. Adding a breakpoint is really easy! All you need to do is double click in the light blue region on the left until a little red blob appears. This is your breakpoint. All a breakpoint does is pause the program (or “break” the program) at this point until you then press play again. Step 3: Now a breakpoint has been set, you can actually start reading in values! If you look down at the bottom right of the screen, you can see the variable names, namely XVal, YVal and ZVal. As you can expect, these are the X, Y and Z values reported by the sensor! The reason RecData is a 32bit hex number is because it is the memory address at which the RecData array starts. To do your first read, press the “Play” button. As you can see, the little red box is the play button! Pressing this will update the data in the bottom right box. To exit debugging mode, press the stop button, two buttons to the right of the play (the bright red square!). The code can be found on github. Hopefully my commenting is sufficient and will help you develop this HMC5883L sensor into your own project! If you have any questions, just drop me a comment and I’ll answer asap! I like all your projects with STM32 and Coocox, because i have chose the same environnement for my home automation (global project open source). Glad you like them buddy! If my french was more up to scratch, I’d get more involved with your webpage but google translate doesn’t do it justice! Just a comment on the shift of the address (#define HMCAddr (0x1E<<1)). It explains itself when you look into the reference manual of ST (RM0091 page 647). For 7 bit adressing the bits 1:7 are used for 10 bit addressing the bits 0:9 are used. Since you are using 7 bit addressing you need to put the adress 0x1E in bits 1:7 which you do by shifting it one to the left. Thanks a lot for clearing that one up for me! 🙂 In their standard peripheral examples, it isn’t too obvious to why they do it. I guess that’s not related to my “wrong” slave interface, any idea where I could start looking? I’ve never actually managed to get the STM32F0xx I2C to work without a device because it won’t go through the steps of having flags cleared etc. and won’t be able to continue the program.You do mention though that your oscilloscope is set up as a slave so I assume that it automatically responds to the corresponding I2C commands. thanks for the background information (and once again for sharing your knowledge on this blog). 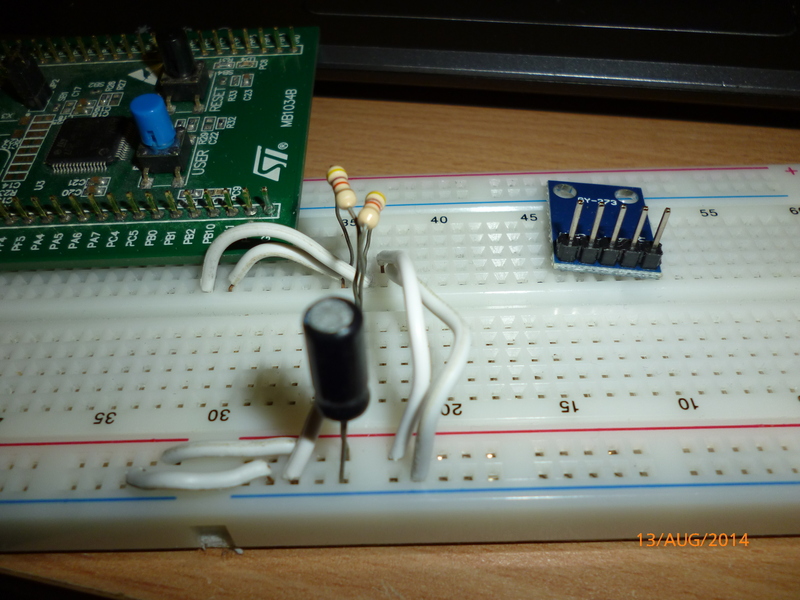 I think 0x1E <<1 is done as device address send in a I2C protocol is 7bit followed by Read and Write mode bit . A nice tutorial by Silicon labs is as below explaining same . Just a couple of things. I just want to confirm this is set up with interrupt mode right? If so do you know if it’s possible to set up the f0 with polling mode? The reason behind this question is that I am trying to use i2c to communicate between a f7 (master) and f0 (slave) and have already set up the f7 to communicate in polling and tested that it worked. This tutorial uses polling mode on the F0 side and would require some further code changes and a state machine for interrupt driven functionality. I haven’t used the interrupt functionality though I can’t imagine it to be too complex. If all that is required is streaming values from the HMC5883L, I can imagine it to be quite simple. If I get chance, I’ll give it a shot in the near future! Indeed very useful tutorial. In my case my RXDR is always 0xFF, I can not understand what is happening. What could be the problem? 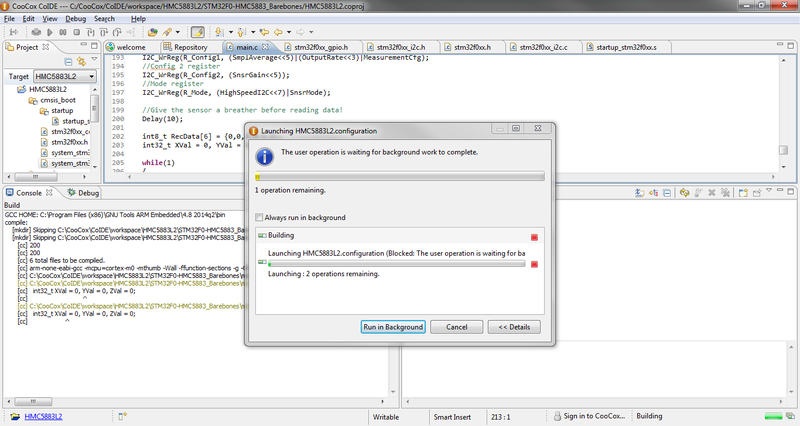 while(I2C_GetFlagStatus(I2C1, I2C_FLAG_RXNE) == RESET); this line it doesn’t get out of loop. This sounds like it isn’t actually receiving the data alright, are you able to scope out the SCl and SDA lines?